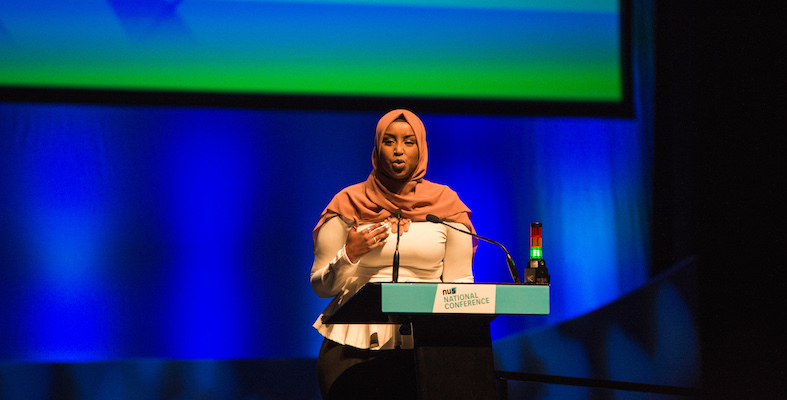 The National Union of Students (NUS) has elected Zamzam Ibrahim as its 60th president. The appointment was made at the union’s annual national conference in Glasgow, where a political direction for the year was also decided. Ibrahim, an independent, beat four other candidates to the role. She had previously served as NUS vice-president of society and citizenship and will take up her new role on July 1. She is the second female Muslim leader of the NUS and the third female BAME president in a row. She was also the only contender in the election to have previously held an NUS office. Ibrahim takes over at a time of immense pressure for the organisation. Last year, sweeping changes were made to the paid-for NUS card after years of declining sales but the reforms backfired, creating a large hole in the budget and prompting suggestions the 97-year-old union could go bankrupt. The conference also decided to adopt the all-party parliamentary group’s (APPG) definition of Islamophobia, which includes introducing new training and procedures to “ensure all students officers are properly held to account on any instances of islamophobia”. Incumbent president Shakira Martin was unable to contest the election due to term limits but last year, in a tweet, described the role as an “awful job”. Martin’s predecessor, Malia Bouattia, faced allegations of antisemitism after she described Birmingham University as a “Zionist outpost” and criticised “mainstream Zionist-led media outlets” prior to becoming president.